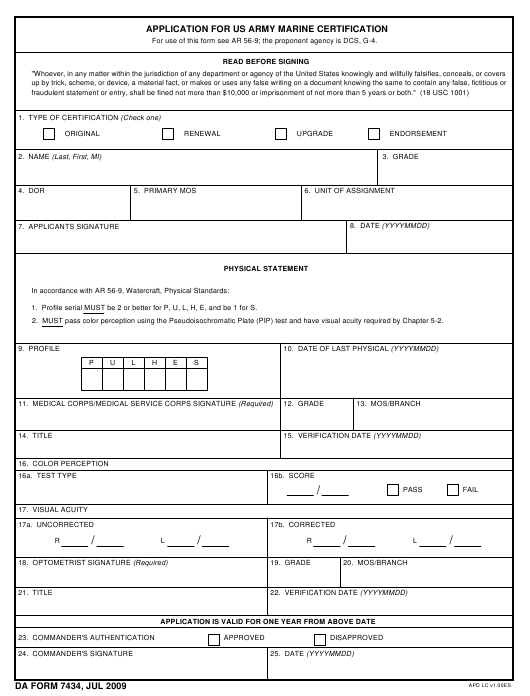 DA Form 7434 or the "Application For Us Army Marine Certification" is a Department of the Army-issued form used by and within the United States Military. The form - often incorrectly referred to as the DD form 7434 - was last revised on July 1, 2009. Download an up-to-date fillable DA Form 7434 down below in PDF-format or look it up on the Army Publishing Directorate website. For use of this form see AR 56-9; the proponent agency is DCS, G-4. 1. Profile serial MUST be 2 or better for P, U, L, H, E, and be 1 for S.
2. MUST pass color perception using the Pseudoisochromatic Plate (PIP) test and have visual acuity required by Chapter 5-2.